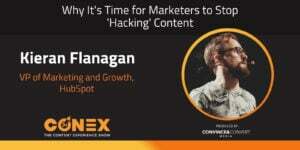 Kieran Flanagan, VP of Marketing and Growth at HubSpot, joins the Content Experience Podcast to discuss the need for alternatives to “hacking” content. What does a wildly successful marketing brand do once success hits and growth explodes? It keeps optimizing, according to HubSpot’s Kieran Flanagan. That optimization, Kieran says, isn’t focused on hacking content or experiments that yield short-term gains. Instead, HubSpot focuses on its long-term goal of winning the hearts and minds of its audience. It even split its content team into two parts: one that targets the “minds” of business owners with its content and another that targets their “hearts.” Through this strategy, HubSpot hopes to preserve its reputation as both a teaching resource for marketers worldwide and a company to which users feel they have a personal connection. 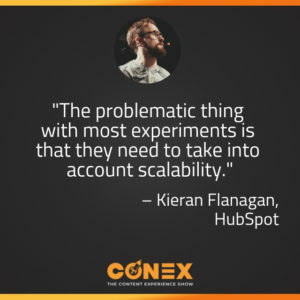 No shortcuts, hacks, or tricks here—rather, Kieran and his team plan for things like scalability and long-term maintenance in each experiment they conduct. You’ll hear these strategies and more in this episode, along with more insights into HubSpot’s approach to top-of-funnel users. How HubSpot’s historical optimization program keeps older content as current and relevant as possible. How HubSpot optimizes its “freemium” offerings to attract more and better leads. If you were to create a (non-marketing) podcast, what would your podcast be about, and who would your first guest be? Kieran would love to host a podcast that explores conspiracy theories. His first guest would be the inventor of the Flat Earth theory, a conspiracy Kieran finds bizarre and fascinating! Anna: Hey everybody. Welcome to the Content Experience Show podcast. This is Anna Hrach from Convince & Convert, and I am here with the always amazing Randy Frisch from Uberflip. Now today we have an amazing guest. Randy and I were both so excited to have him on. We have Kieran Flanagan, who is the VP of Marketing and Growth at HubSpot. Uberflip is a partner with HubSpot and obviously at Convince & Convert we're massive fans of the content that they produce, and I'm a massive fan of all of that work as well. So we're just really excited to chat and Kieran has some just amazing advice, which is basically stop hacking everything and just focus on predictable growth and do the right thing. And Randy, I know that's probably not the advice everybody wants to hear, but I think it's the advice everybody needs to hear. Randy: Yeah, I mean, between you and me, I think it's ... in HubSpot's case there is some sort of special sauce there. I don't know. Maybe he just didn't want to share it with us. Anna: So you think he was hiding it? Randy: It is truly amazing what that company has accomplished. I think they don't want to give us the secret. I don't know, I mean, 50,000 customers, I think it's 2.6 million social followers. The numbers are insane. But back to his point of it's not that one silver bullet, I think in their case it's because they do so much. And they figured out how to tackle the market in so many ways. Randy: One of the things that I found interesting was when they talked about the different ways that they now look at getting users. And the original HubSpot model was all inbound. It was generate users through inbound. But now they also have freemium product where ... I think he called it a PQL. So a product qualified lead, which we didn't really go into detail and I found that pretty interesting. They obviously have PQL. But then the last one we also didn't talk that much about is they have users who strictly use them for learning and content and they don't monetize those people. But it's their opportunity to learn, as calling those people instead of just an audience, they're an actual user of the HubSpot offering. Anna: Yeah, and Kieran has some really great points just about those users who are just there for content and how they've actually managed to sort of go with their formula of winning hearts and minds, which he will go into. But for those of you who are really interested on digging more into the freemium side of things, HubSpot actually has several articles about the benefits of going freemium and what that looks like and how to determine your freemium model almost. So really, really fascinating topic and just how much that lowers the barrier to users and getting customers. Randy: Absolutely. And Kieran's a natural in this podcast. He's got a podcast of his own, which he'll speak about as we dig in here, but I think everyone's really going to enjoy this one. This is definitely going to be one of our most downloaded episodes. Enjoy everything coming your way. Here we go with Kieran Flanagan. Hey Kieran, thanks so much for making the time today. I'm really excited to talk about all that is top of the funnel, although I know that's not the only area that you focus, but I think we'll end up going really deep in terms of how content can be used at the top of the funnel to feed revenue in the long term. And I know at HubSpot you've had many different roles. Maybe you could, just for everyone listening, because I think people think of HubSpot in certain ways or what it does, but what are the areas that you've touched along the way and where do you focus now? Kieran: Yes. So the really quick introduction of my time at HubSpot, I've been very fortunate to work in a high growth company because I like to change what I do every kind of couple of years. And so, at HubSpot for the first kind of two and a half years, we were the first group of people, of 12 people, to be hired outside of our Cambridge office. And we started the international business. That grew pretty rapidly. So we were very fortunate that international growth went well for HubSpot. But two and a half years into that we ... I joined another small team. And that team's mission was basically to apply ... or find a new kind of go to market for HubSpot. And we did that through freemium. So we launched a lot of our sales products, all with freemium first, our CRM and our sales hub, and around 2018 we kind of adopted that freemium across the entire company. And at that point I changed roles again. So when I was in freemium, I owned the full funnel, marketing, growth, and had some responsibility for our touchless revenue. And then when we swapped, when we kind of acquired that company, I took on the entire top part of the HubSpot funnel. So all of our global demand that we generate through our leads and users, which I'm sure we'll get into in this episode, comes through the teams that I manage. And the cool thing about HubSpot is the revenue that we generate actually comes from marketing demands. You kind of feel very accountable to the actual revenue number. Randy: Absolutely. First off, I find that interesting personally. I think a lot of us assume that HubSpot's got this big sales team that goes out and probably handles inbound interest. But it's interesting for people to know that there is that freemium model. And I'll let you know, I honestly, I use the HubSpot for sales product now, for some of my own day to day needs in terms of templates that I send out and things like that. It's just a great, great solution for making me more impactful. So maybe we can dig a little bit into this idea of where does the funnel start for you guys? Because I think that's a misconception that some people have, especially when we're thinking freemium models. The question is, does it start in your mind tracking someone at the content they're engaging out on the web before they sign up? Or is it after they sign up? How do you determine that? Because someone in theory could go directly to HubSpot, right? They could go the route of saying, okay, I need the more robust HubSpot platform, including the marketing solution, or I may go down this more freemium path. Kieran: Yeah, it's a great question and it's definitely complicated it in today's kind of HubSpot world. So I'll give you the kind of overview of how we maybe plan out our demand model. Because I can kind of give you the kind of the basics of how we would do that. So within HubSpot you can kind of start your journey in three ways I think. And more and more it's become you start your journey with a HubSpot account. So you can decide that you want to try our free products. So we have free CRM, marketing, sales, and customer success products. And so we have people who start their journey as a free software user and they come in through one of those sign-up points. They sign up for a CRM, a marketing, a sales or a customer success tool. We really just think of those as software users. We have something else called a content user, which is actually growing, which are people who start their journey by creating an account to consume content that we are ... we have in what we call our learning center. And that is an as an app for someone to consume content. And that's for both non-HubSpot customers and customers. And the number of people who are coming in and starting their journey as a content user is actually growing really fast. And then we have leads, which are the kind of traditional way that HubSpot has kind of started off. And that's someone who wants to download content through our forum. And so what we have is a revenue number that we are accountable to each month. So we know how much revenue we need to generate each month. We then work back and we know how much leads, content users, and software users we need to generate to hit that revenue number. And in between there, there's actually other things that we, I can go into it more deeply if you want, but there's opportunities, there's marketing qualified leads, and something we call product qualified leads. Product qualified leads come from the product itself. People raising their hands on the product, people hitting certain triggers in the product. And we would take those either to sales team or they upgrade themselves through our touchless motion. And then we actually work back then to traffic. And so we know basically how much organic traffic we need to generate across all of these different properties. We know how much other types of traffic we need to generate that will result in that amount of demand. And in that way, the reason we do that is because when I get my numbers of the start of say 2019, I'm able to build a predictive model for 2019 right to the end of the year and look at the historical growth rates and traffic. The historical conversion rates through the funnel. And pull that forward and say, well if I just grow the same rate as I did last year, where are the gaps that we hit in my plan. So it allows me to plan a lot better in terms of my resources and the things that I want to invest in for the coming year. Randy: All right, so I'm trying to figure out which path to go. Because I feel like we could do three podcasts right now. One for each of the strategies. Because there's probably so much to from you. Why don't I let you pick the one that you think is going to apply to people here. I personally, I'm intrigued at the idea that you consider someone who's not even paying you, not even using product, a user, because they simply consume your content. But that's just a point within there that I find interesting. Kieran: Yeah. I can start off, I can go to two things that I think will be valuable to your audience. Because one of the first things is, okay, well the difficult thing for a company like HubSpot is the numbers just keep growing. So you would look at HubSpot and you'd say, okay, they've been a pretty successful company. They generate millions and millions of visitors. They generate six figure number of leads, a growing number of users, a lot of demands. That's great. And it is great. But then what happens is every year you have to increase that by 30% to 40%. And so you're already utilizing all of the channels you typically think of and you're kind of doing a pretty good job. But you have to figure out how you can either get better in those existing channels or layer on new channels for growth. I think regardless of where you are in your kind of marketing journey, you're at either one of those spectrums. You're either, find a channel that fits your product and is working really well and you go all in and that channel or you've kind of hit a peak in a certain channel and you're kind of scrambling around for additional growth. And I can tell you one of the things that has really worked well for us that has historically drove a lot of growth is within how we approach content. We're, not to boast, but we're pretty good at content and search and that inbound kind of go to market. But we could still ... we still found ways to improve upon this last year. And the way we did that is that we kind of separated our content teams into two different places. And we thought, how do we win the minds, hearts and minds, of every SMB and mid-market owner within our space? And when you start to pull that problem apart, how we win the minds of these business owners is we create tactical content that teaches them something, helps them solve a problem they have. And when we look at how we win the hearts of those people, we create an emotional connection to something they truly care about it. And we separated the teams into a “mind” search content marketing team. That team is the blogging team and all of the content teams that create tactical content. And that approach is very search driven so that content fits with Google. That's the type of content, it fits with Google. And we only create content that we know has searched a month. Like typically about 80% of the content we create from those teams has existence, search demand and that content is all created through a search editorial calendar. And that editorial calendar is a very scientific process of how we kind of distill down all of these topics we could create content around and then stack them by available search traffic. But the “heart's” content team is really thinking about that problem in a very different way. So their channels are different. They're typically social, podcasts, video, the channels that allow you to create a more emotional connection with someone and help someone understand your mission. And that team also have their editorial calendar, but it's kind of built in a different way. It's not search driven, it's based upon the mission of the company, the themes and topics. And taking that approach has really accelerated our success. Over the course of 2018 we blew away all of our record numbers in terms of organic. Our content in the heart section has got a lot better. And that distinction between those two different types of content teams has definitely been something that has helped us improve within an existing channel. Anna: I think you absolutely have the right to boast. We were chatting about this offline, but I'm a massive fan of the content that HubSpot creates. I think it's really interesting actually to hear the methodology behind it and it makes perfect sense, having the heart and the mind teams. But one of the things that I love too is, even though you had just mentioned that you're really only on the mind side, creating content that has search demand, that content is so unbelievably high value. I have never once clicked on a HubSpot piece of content that I didn't get something from or I couldn't pass on to somebody else in the industry. So it's funny that you say that that's really the mind side. But that content has so much heart to it still, I don't feel like it's lacking from any of your content. Kieran: Yeah, absolutely. So, though we've distilled that into a scientific approach in terms of deciding on the content to create, the creativity and the kind of emotion and everything that gets put into that content is still the same as it would be on the heart side. Because we still hold ourselves accountable to creating content that has results. And so if there's content that is not generating traffic or acquiring links or generating demand, we will either invest time in optimizing that further. We call it a historical optimization program. We go back through underperforming content and we look for content that we can optimize further and see if it actually starts to succeed. If it does not, we do something which we called content pruning. So we actually start to ... we will redirect that content to somewhere else. And that way we keep all of the content that we have live if content is actually generating results for us. And it helps Google ... Google can index your best quality content. It with search. And so the mind's part is not, how do I create as much content as quickly as possible? It's still, how do I create very high quality content, but I know that people actually want this because I have a systematic way of proving that there's actual volume of search traffic for it. Anna: Nice. I definitely want to keep digging into all of this amazing content and this approach and this methodology because everybody should be taking notes right now, but we have to take a super quick break to hear from our sponsors. So everybody stick around. We're going to dig even further into the HubSpot content in just a bit. 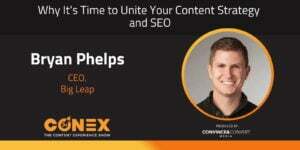 Jay Baer: Hi friends, this is Jay Baer from Convince & Convert reminding you that this show, the ConEx Show podcast is brought to you by Uberflip, the number one content experience platform. Do you ever wonder how content experience affects your marketing results? Well you can find out in the first ever content experience report, where Uberflip uncovers eight data science backed insights to boost your content engagement and your conversions. It's a killer report and you do not want to miss it. Get your free copy right now at uberflip.com/conexshowreport. That's uberflip.com/conexshowreport. And the show is also brought to you by our team at Convince & Convert Consulting. If you've got a terrific a content marketing program but you want to take it to the very next level, we can help. Convince & Convert works with the worlds most iconic brands to increase the effectiveness of their content marketing, social media marketing, digital marketing, and word of mouth marketing. Find us at convinceandconvert.com. Randy: All right Kieran, I am excited to dig into the second half here. And the first half we talked about, as you put it at one point, the problem with HubSpot is a great problem. It's how much attention you get and people come truly interested in the content that's been created because you've been doing this for over 10 years, I think, a source for content that helps us as marketers figure out what to do. And some of the stats are amazing. 4.5 million monthly blog visitors, over 50,000 customers, 2.6 million social followers. It is wild, the success of HubSpot. And part of us would say, okay, well as long as people keep coming through these SEO channels, we just have to sit there and create content. But I know that's ... that you don't just sit back. You also find ways to put content in front of places that people are going when they're not coming to your site. Maybe outside of SEO you can give us some of the strategies that you're most fond of in terms of your go to market. Kieran: Yeah. I think the thing with content is there's two elements, which is like the push and pull. So the search part is, we take in demand for what people are already searching for and then if needed, you can give them the thing they're looking for and help them to see that there's something else that they may have not thought about that as relevant to the thing they're reading. And that's kind of how we grew the marketing product. One of the good things about a marketing product was we were able to acquire people on things that were searching about. Like how to generate more leads and all these things. And then show them that there is a tool that help them do those things. And then there's the other element which is not as good a fit for search, which is, how do you get people to feel actually something about your brand? And for HubSpot, typically we ... the evolution of that for us was, I think, the thing that HubSpot did well was, and I think most brands who do well, have some sort of enemy in mind or take some sort of stance and something and that helps people feel emotive one way or the other. It's better to be on one end of that spectrum versus being a brand who just sits in the middle. And ours was inbound versus outbound. And people felt some kind of way about that. And I think the best challenge for us when you're trying to get people to connect to a mission typically have been podcasts. And so I think that's one of the things that we've invested a lot in. We have three podcasts now and they're kind of flat. The premier podcast is the Growth Show and that helps to tell those stories about how brands, people are growing their companies in really great ways. And really, it's really how do you go where the people are? So Facebook is still a good channel for us because that's where the people are. We've invested more in YouTube recently. I think that's an interesting platform. We're still unsure if that fits in the heart or mind or both. We've definitely been using it a lot for the kind of mind part where we are teaching people how to do things, but we started to invest more in, can you actually build a connection on that platform? So we don't have, I don't have the hidden platform that people probably want me to have that they haven't thought about. Because the unfortunate thing for all brands are is, to reach people you have to go where they are. And they're either on Google, Facebook, or some other kind of niche platforms. And so they've been our core distribution channels. And obviously I would have to mention our event that takes place in Boston. That's an in-person way of reaching people and it's going to be about 24,000 people this year. So that's another good way to reach a sizable audience. Kieran: And I've looked for it. Anna: I Know, everybody ... And trust me, I mean, if it was out there everybody would be using it right now or somebody would've figured out a way to sell it for a million dollars and be wealthy beyond our wildest dreams. But that's also something that you talk about too, which is just that creating predictable growth is not a hack. There's no hack for any of these things that your team has accomplished or that HubSpot has accomplished. It just is what it is. It's a lot of hard work. It's a lot of effort. It's a lot of research. It's a lot of quality. There's no hack, there's no "hack". Kieran: No, what I find is, it's finding something that works and doing it to an extent that no other person would put the time and effort to do it to that level. So when we decided that search worked we were all in on search. We would spend a lot of time and the things that people may find boring, which is like how do you keep the site quality high? Redirects. All of the things that that go into that. And so there's not ... There's experiments within a channel, but it's just to get you to be better within that channel. And so we've definitely found that actually there's not hidden tricks or tips. A lot of it is just investing in the correct things and go in, all in, extracting as much growth as you can from, from that individual channel. Anna: I'm just really happy to hear, and sorry, not to cut you off. I'm just really happy to hear that you ... because again, I feel like again, everybody's just trying to hack everything, or find the speediest, fastest way to get there. And I think really it cannot be emphasized enough of what you just said, which is that it's just investing. It's investing the time, it's investing in the right approach that works for you. Kieran: Exactly. Yeah. And I think there's ... even though most of the hacks I've seen are clever experiments ... And the problematic thing with most experiments is that they need to take into account scalability. So if you are running an experiment and you're like, okay, if you haven't asked your question about, well, if this experiment is true, how do I scale this thing? Then you're continually on this kind of rollercoaster ride of like, oh, I've got something that wins, I need to go and scramble to find something else. Oh, I've got something that wins. But most experiments actually fail. So we've run thousands of experiments and we've had way more failures than successes. But one of the things we force ourselves to do is we write an experiment doc to do these kinds of hacks, which are just experiments. And within that experiment doc we would have, if this is successful how do I scale this thing? And you have to have something that's scalable or you're just not going to invest in it and it's not going to drive long term growth for the company. Randy: I love that. One of the things is you say that you stress the importance of experimentation, which is actually something my team is really taken on lately as a renewed focus. What would be, just as we start to wrap here, what would be three questions that marketers should be asking themselves about their current strategy? Because rather than, as you said, there's no silver bullet. We just have to do it well, we got to work hard. And I think a lot of people, we say to ourselves, well, I thought I am working hard. I thought I am doing it well. But what are three things that that help more from that experimentation mindset that says, how do I challenge my thinking? Kieran: Yeah. When we think about the things we work on, we think by prioritization. And prioritization sounds easy, but if we think about it, what most people do is they think of the priority of their thing within the context of how they work or the area that they work. So what we ask ourselves is, is this the most valuable thing in business can invest in? Not the most valuable thing the team can invest in or the search team can invest in. Is this the most important thing or the most high impact thing that the company can invest in? Because most of our things today within HubSpot actually require time from engineers or product people who have a whole other list of things that they could be working on. Because when you're in a freemium company, a lot of the things you want to experiment on now touch the product. And so that's one of the things we had to get better at, is actually thinking beyond just marketing and what are the most important things that all of these teams could ask to rally around? The other things we think about is, have we any prior history of doing this thing? And so the reason we think about that is because if we have prior history of doing this thing and we've been successful, then it's more likely that we're going to be successful again. Whereas, if this is a brand new thing that we have started from scratch, then it's more of an unknown, so it's more of a risk. So that actually is a good way to determine how risky of a bet this thing is when you're doing experimentation. And then, so I think there are a couple of things that we would think about it. And then the other one is the two gotchas ... there are a couple of gotchas in experiments and they're actually kind of common. But you always kind of find teams that don't think through them and we probably have not thought through them properly at times is, we talked about scalability. The other one is maintenance. I know that's really boring, but a lot of the things that we work on actually we create something or we build something and there's a maintenance ... there's an ongoing maintenance expense to that. So when you're trying to determine the cost of implementing something, we think of the operant cost of someone's time, we think of the operant cost within budget, whatever that is to do that thing. You don't think about what's the ongoing maintenance to keep this thing alive. And so we follow a lot of free tools. People probably know HubSpot's marketing grader, but we built other tools. And so if we were going to kind of sit down and go, okay, could we build this tool to rank for these three keywords? And then we would have to think about both the upfront costs and then the development costs of when people try to use that tool and it breaks. And our style guides all change and we have to update the style guide of the free tool. When the thing that the free tool is doing relies on an API and that API has been updated somewhere else, who is accountable for those things? And so that's one of the other things you need to really think about when you're going to go through: what are the things I should invest in and experiment around as a marketer? Anna: Nice. Love it. I can't think of a better way to leave our listeners then with all of that amazing advice and tips and tricks. So Kieran, thank you so much for joining us today. Before we do officially end the podcast though, where can people find you? because you have a podcast of your own. Kieran: I do. I have a podcast called the Growth TL;DR podcast. And so yeah, it's a lot of fun. We interview people from predominantly product-like companies, companies that have a freemium, free trial, have a lot of interesting things going on. You can find me on there. You can find me on Twitter at the worst Twitter handle called searchbrat. And you can find all things HubSpot on HubSpot.com. And also you can check out our podcast. We have three pretty successful podcasts on there. Anna: Fantastic. All right everybody, so go follow Kieran. Check out his podcast as well. And then stick around because now that we've gotten to know the professional side of Kieran we're also going to check out his personal side. So we're going to have a couple of fun questions coming up right after this. Anna: Hey everyone, I wanted to take just a few seconds today to talk to you about Emma. Emma is an email marketing platform that helps you connect with your audience and grow lasting relationships. They're awesome. They offer really intuitive tools to build an automate emails with powerful segmentation and reporting too. And the big difference is they're focused on you. Between their award winning support and their pro services team, they make sure every customer has success with their email marketing. Seriously. They are amazing. You can learn more and request a demo today at myemma.com/jayisawesome. Again, that's myemma.com/jayisawesome. Anna: Hey everybody, welcome back. We have Kieran here and as we mentioned before the break, we're going to get to know a little bit more about the personal side of Kieran. So Kieran, here's your question. You have a podcast already, but if you weren't doing a professional podcast or something that has to do with marketing, what would your podcast be about and who would your first guest be? And Randy, tee up your question too, because I'm curious on yours. I know we ask this on occasion, but it changes, personal life changes. So Randy, get ready for yours. Anna: I heard about this. Kieran: Yeah, it was the most bizarre hour and a half that I have ever spent in my life. And I would get the guy on who invented the flat earth conspiracy because he is totally nuts. And I think it would be a good hour of my life of I'm trying to understand how he came to this conclusion that the Earth is flat, how you don't fall off the earth, how airplanes work in the flat earth when we're covered by a bubble. So there's a lot of questions I have and that's what I would love to do. Anna: Can I recommend a name for that podcast? Kieran: That's cool actually, yeah, I like that. I'm going to actually ... there's a lot of conspiracy theories that people, I think ... I'm just going to go on to Reddit. Anna: I Know, I'm a massive fan of conspiracy theories as well. They're fun. Yeah. Kieran: That's my next one. Anna: I love it. I also feel like you could still have Will Ferrell on in the background. That would still be entertaining for that first episode. Kieran: I can get Will Ferrell as my co-host. Kieran: To talk about flat earthers. That's gold. Anna: That would be gold. Randy: That just hit number one podcast. HubSpot's got to worry. HubSpot's got to worry. Anna: Nice. All right, Randy, what about yours? Randy: So I, in my downtime, the way I detach with mindless information is I listen to sports radio. I don't know why. I just, I think it just ... It's so silly the questions that they ask, that it lets you escape and not worry. Because a lot of the questions are softballs, et cetera. But I always thought what would be interesting would be a podcast that talked to the parents of all these sports heroes. What are their stories of their kids growing up and what did they have to go through? And when did they know that that kid would be special in some sort of way? And I think people would be really amazed by that. I think part of that is because I'm a hockey dad and some of the parents are just crazy. Some of them are amazing and caring and some of them just, they're just weird. They're intense and they're weird or they swear too much in front of their kids. It's really weird. So I think you'd get such an interesting mix of people, with some heartfelt stories and some stories where it'd be like, that person is terrible. How did that kid succeed? Kieran: There's a couple of well known biographies. I don't know, so I know that Andre Agassi biography, I haven't read it yet. I've heard it's phenomenal. But a lot of it does focus on how intense his upbringing was, and I think the Williams sisters had a pretty intense upbringing in. So I think that there are parents that are very determined their kids are going to succeed and probably have more determination than their kids about succeeding. So I think there'd be a lot of good stories in that. Randy: I love those. Andre Agassi's shoes from back in 1990 or whenever it was, those were amazing years. Kieran: I was a huge ... I had all of his rackets, played lot of tennis, so he was a hero to me. I can see back in the Vegas days when he had his long hair. Randy: Exactly, exactly. It was the shoes for me. I fell in love with them. I had multiple pairs. If I can find those today, that'd be great. Anyways, Kieran, this has been so much fun. Honestly, I'm a big fan of HubSpot. Uberflip is a partner of HubSpot as well, so there's always been a great relationship between our companies. It's great to chat with you, hear about some of the ways that you're growing the business in very logical ways. You said there's no silver bullet, but it's a lot of things that are being done well from so many different channels and there's so much that we can learn. Sounds like the best place to continue to learn is to go to the blog, check out a lot of that content, check out some of the podcasts. For those who have enjoyed this podcast, we've got a whole bunch of other episodes you can check out. You can go to the Uberflip site, you go to the Convince & Convert site. You can obviously also go to Spotify and Google Play and iTunes and all the other places you get podcasts. And when possible definitely leave us some feedback. What are you enjoying? What you want to hear more of? Until next time. Thanks so much to Kieran Flanagan. 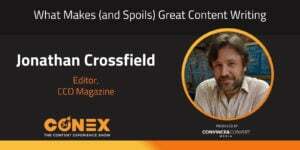 I'm Randy Frisch from Uberflip with Anna Hrach from Convince & Convert, and this has been the ConEx podcast.